Gambling in casinos is legal in the Dominican Republic. Casinos here are part of resorts. They normally open late in the afternoon or early in the evening. Don’t expect this to be Las Vegas. 45,000-square-foot Casino with over 450 of slot machines. Fourty different tables, from Poker room to Blackjack, Craps, Roulette and Baccarat. Salon Prive VIP area where you will find high limit Baccarat, American Roulette and Blackjack. The 5 star Sports Book offers wagering on all major sporting events. 32 machines and eight gambling tables. Charts, tables cards are distributed for fun and comfort, there are two American Roulette, Three Black Jack, a Caribean Poker, a Poker and Texas Hold ’em. Open daily from 16h00 for slot machines, and from 20h00 – 03h00 for table games. Gaming options include slot machines, black jack, Caribbean poker and roulette. The Casino is open from 7 pm to 3 am every day of the week. Admission and bar service are complimentary for guests of Excellence Punta Cana. Ocean Tower Casino in Punta Cana s open daily 7pm-3am. The casino’s 5,500 square foot gaming space features fifty-two gaming machines and nine table games. 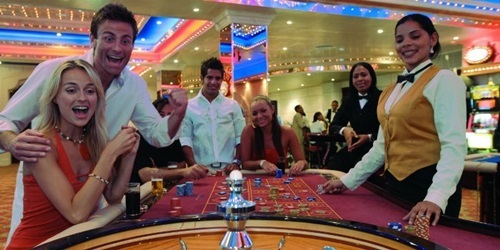 It features 52 gaming Machines and 9 table and poker games.